I love laulau, especilly fish laulau. 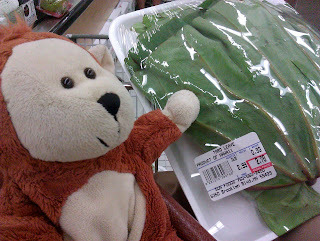 It was a real treat today that I found fresh taro leaves (also known as lu'au leaves) from Hawaii at an Asian store that I don’t usually shop at. I just have to make a few classic pork laulau for my hula sisters and my Kumu. I also thought of my non-meat eating friends. 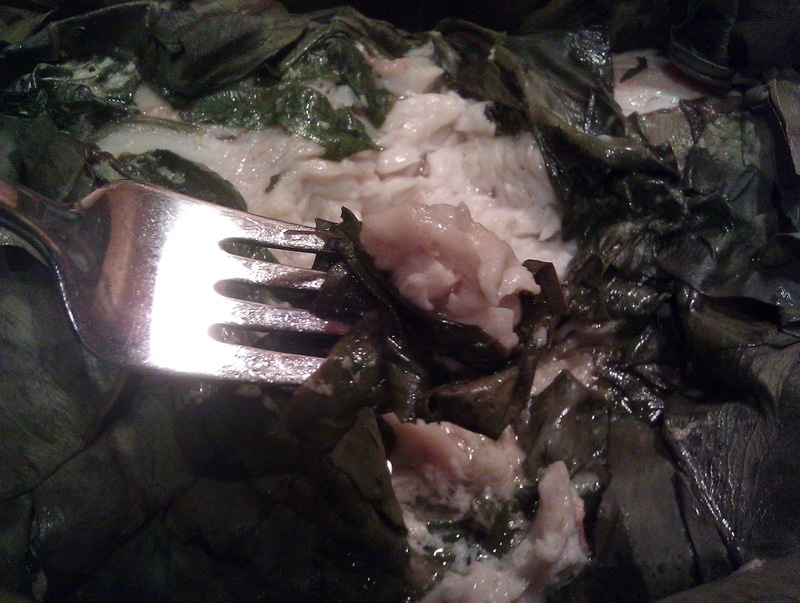 Back in Hawai’i, fish laulau is usually butterfish. I have seen my fish guys carry it every now and then. 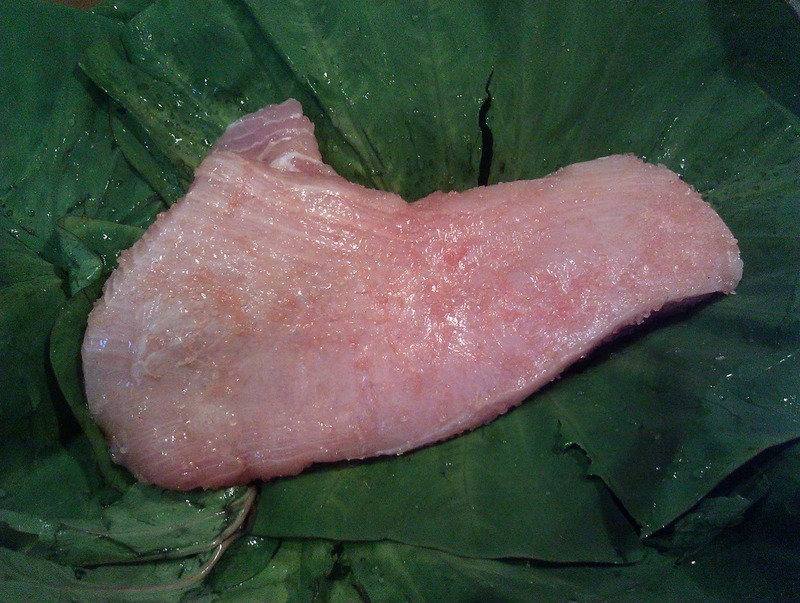 Butterfish is actually known as Black Cod on the Mainland. Unfortunately they didn’t have any today, however there was some beautiful Opah (Moon fish). I found a nice piece of whole fillet. I decided to cook it whole. 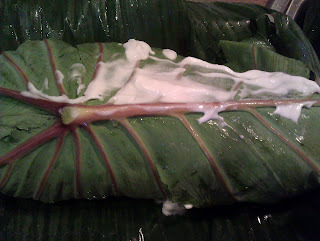 Here it is my version a modern Baked Fish Laulau, since this is not really Hawaiian, I added coconut milk for flavor, fat and moisture. It made the fish very buttery and smooth. 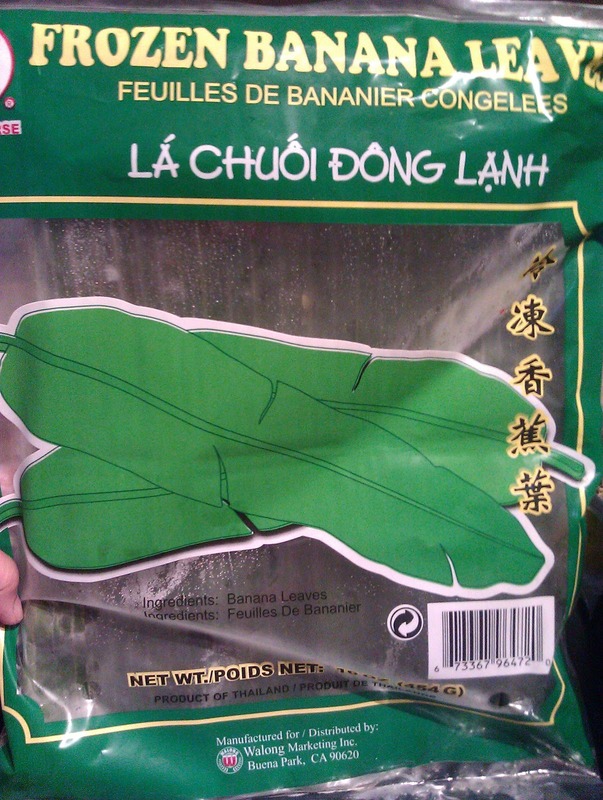 The coconut flavor compliment the leaves very well. I hope you like it. 1.5 lb of firm white fish fillet, I am using Opah, cod will work very well in the recipe too. Cleaned, remove the skin. Pat dry. 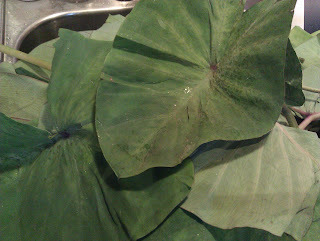 7-8 large taro leaves, trim the stems and discard, wash and raise thoroughly. 1 12”x12” piece of banana leaf (I am using frozen leave which you will find at the frozen food section in most Asian store. 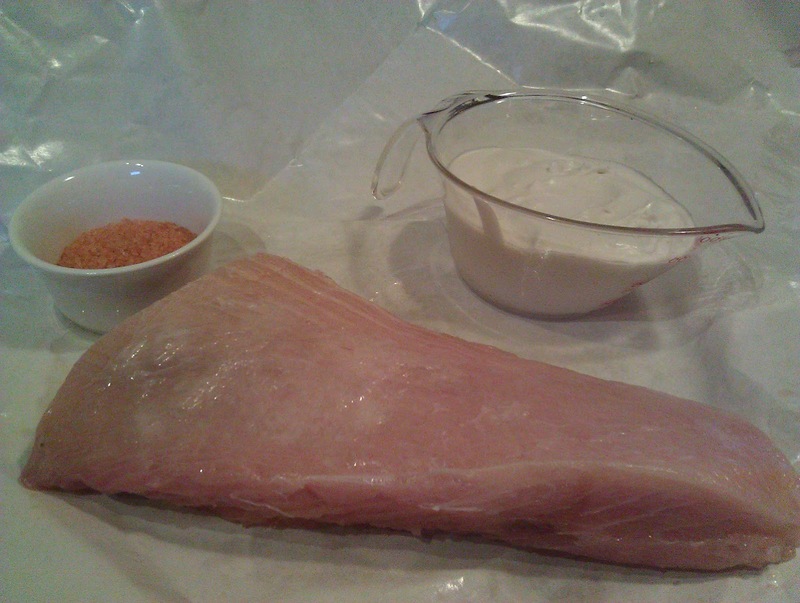 In a large bowl, rub Hawaiian salt generously on the fish fillet. Let stand for about 10-15 mins. 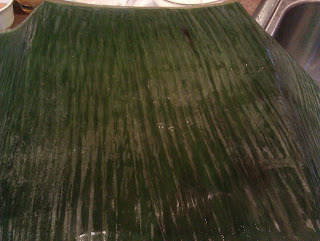 Lay the banana leaf in a baking pan..
Top with the largest piece of taro leaf first, then layering the smaller ones on top. Place the fish in the center of the leaves. Gather the leaves around the fish, pour in coconut milk. 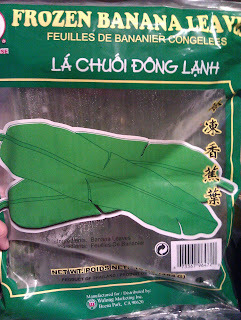 Wrap the fish with the leaves. 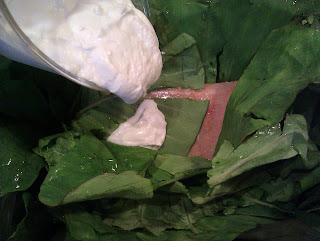 Turn the taro leave seam down to the bottom, if the coconut milk leaks, not to worry about it. Tightly cover the baking pan with foil. 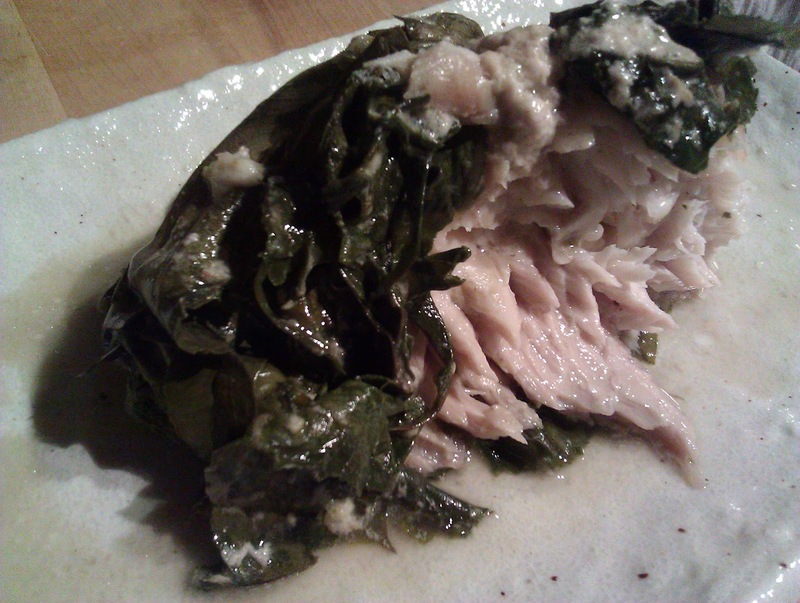 tear back the leaf to revile the vegetable and the fish. This is a dish great to serve family style with rice on the side. The fish is so tender; you don’t need a knife to cut it. Make sure you serve the fish with some of the vegetable and top with a couple spoonful of the sauce. Great job Kulia! Love the pics. I am learning i can try other types of fish as i love Ahi, just too expensive here if i do find it. Good descriptions of step by step too. Keep up the awesome job! I see a cookbook in your future. I love Ahi too, but I prefer to cook it more to a medium rare or just raw. With a long cooking time, I would suggest using cod, halibut or other meaty Atlantic fish. I think you can get it at a reason able price during certain time of the year. Have fun experimenting! 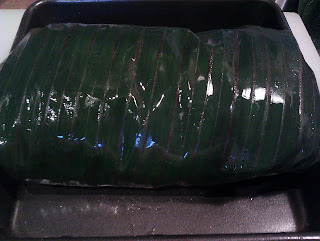 I decided to steam the 2 laulau. It's been steaming for an hour. How much longer do you think I should steam them for?